Two recent University of Lynchburg graduates are one step closer to their dreams of becoming pharmacists. Kierstin Reid ’17 and Jeff Brochetti ’17 will attend pharmacy school at Virginia Commonwealth University beginning this fall. 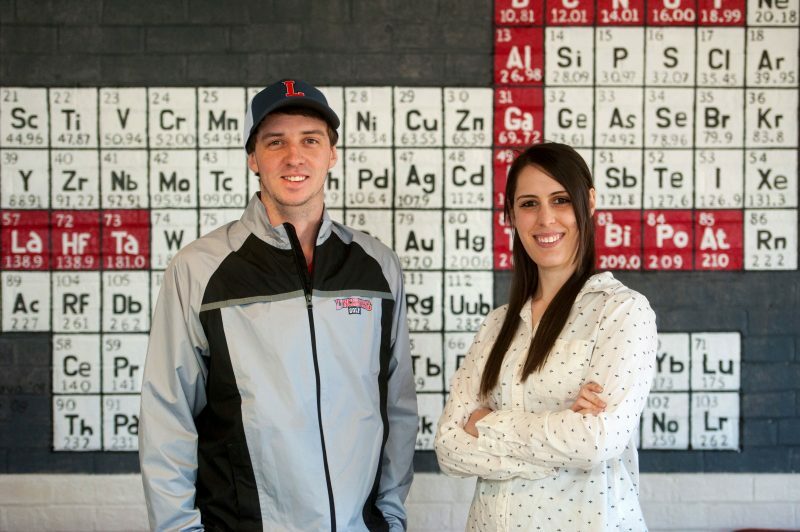 Their extensive research and internship work in the chemistry department at Lynchburg helped them secure spots in one of the nation’s top pharmacy programs. Kierstin practically grew up on campus, where both of her parents work, so LC has always been like a second family to her. It felt natural to attend a school where she felt a connection to so many people. Jeff, on the other hand, looked into Lynchburg at the recommendation of his high school golf coach. “He said the science program was exceptional here,” Jeff recalled. The classes challenged Jeff, especially as he balanced academics with other activities, like golf and intramural sports. But the challenge helped him learn more. He got a lot of hands-on experience with lab instruments that students at some schools only get to see and read about. “Also, the VCU pharmacy admissions thought the amount of recorded research time was impressive,” he said. Kierstin had a similar experience not only in the Lynchburg lab, but also in a real company. For more than two years, she has had an internship at Fleet Laboratories, where she has worked on a team developing over the counter products. “All of the countless hours of teamwork and group projects at University of Lynchburg prepared me for success in industry and has opened my eyes to the many things I can do with my degree,” she said. When asked to name a professor who had a profound impact, both students mentioned Dr. Priscilla Gannicott, who taught their analytical chemistry course and got them involved in research. While they see her going the extra mile for them, she sees it as the natural thing to do for any student. Dr. Priscilla Gannicott works on a research project with Karen Butler ’14. That type of attention helps students become attractive to employers and graduate schools. Jeff and Kierstin follow on the heels of Victoria Weiser ’13, who just completed her doctorate at the VCU pharmacy school. Several recent Lynchburg chemistry graduates have completed VCU’s forensic science master’s degree, and faculty there have expressed a desire to work with more Lynchburg graduates. In addition to faculty, Kierstin enjoyed the support and interaction with her peers. 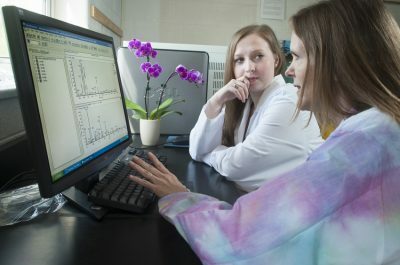 “Ever since I became a chemistry major, I have felt a really strong connection between my professors and fellow chemistry students,” she said. “It was the camaraderie I felt working with other lab assistants, studying late nights and weekends with my fellow chemistry majors, and developing chemistry demonstrations that made me feel welcomed.